"We're Still Fine -- We're Still Great! Older and Wiser than '68!" Our 50th Class Reunion was a blast! The top left menu link "50th Reunion Registration" will remain active so you can view your online receipt and reunion activity details. Thanks to everyone for your support and participation! 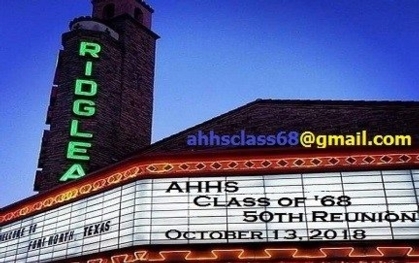 Click the top left menu link "50TH REUNION REGISTRATION" to see the activity details or to view your online receipt, or email us at ahhsclass68@gmail.com. To check your settings, click NOTIFY ME on the left menu under Member Functions. If you need to update or edit your name, address, phone, email, etc., click EDIT CONTACT INFO under the Member Functions menu. To update or edit your responses to questions, etc, click EDIT PROFILE. Be sure to save your changes by clicking the Save Changes button at the bottom of the edit screen.